Silver prices followed much the same pattern as for gold yesterday, trading in a narrow range and ending the session marginally lower on the day with a narrow spread doji candle with small shadows both top and bottom. The price action for the price of silver yesterday (as indeed for many markets) was largely dictated by the comments of FED Chairman Ben Bernanke, as he began the first of a two day testimony on the US economy in Washington. This is scheduled to continue today, so we will no doubt see a further day of indecision and doubt as the markets hang on every word, duly analysing his statement and comments for any underlying signals as to the direction of fiscal and monetary policy in the medium term. For silver traders this means trying to establish whether the current upswing in equities is likely to continue and the extent to which the FED will be able to tame inflation, if and when it arrives. From a technical perspective it is interesting to note that whilst the general direction of gold and silver prices is correlating, the general strength or weakness of the move is less well defined. 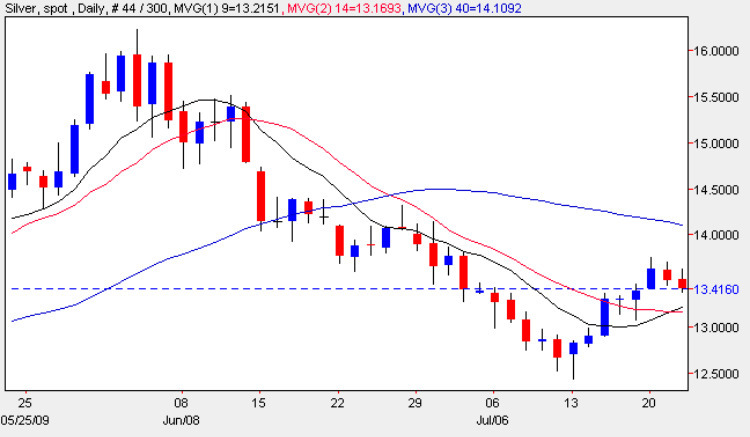 For gold, the current price is sitting well above all three moving averages which are providing strong support to a move higher. For spot silver prices however, the picture is slightly different with the 40 day moving average sitting well above the current silver price, and weighing heavily downwards, a far from bullish picture. This is reinforced by the fact that the level of ‘clear air’ above is deep, so we have some way to go before this important technical indicator becomes supportive once again, and only a break and hold above the 40 day moving average, coupled with penetration of the $14.24 per ounce level, will re-establish the bullish view, which is currently in play in the gold chart.